ARMember is a relatively new entry into the world of WordPress membership plugins. Developed by the people at Repute Infosystems, it positions itself as a “complete membership solution” for WordPress without the need for “any advance knowledge of programming”. Available from CodeCanyon, ARMember offers unlimited free and paid membership plans and works with multiple payment gateways. In this review, we’ll take a look at its main features, how to set it up and work with it, and give you our thoughts about its features and functionality. 1. In your WordPress admin, go to Plugins… Add New … Upload Plugin. 2. Click Choose File, and find the .zip file you downloaded from CodeCanyon. Note: If you previously downloaded “All files & documentation” from CodeCanyon, you’ll want to open up that folder and choose the .zip file that just contains the ARMember WordPress plugin files. 3. Click Choose… Install Now. 4. After the plugin is installed successfully, click Activate Plugin. At this point, you should see the ARMember listing in the sidebar of the WordPress admin. Now, you’ll need to activate the product license for ARMember. As noted before, if you previously downloaded “All files & documentation” from CodeCanyon, you’ll be able to find your product license within the folder you downloaded. Otherwise, you’ll need to go back to CodeCanyon to get your product license. 5. To download your product license from CodeCanyon, go to codecanyon.net and sign in, if needed. 6. At the top right menu of CodeCanyon, click on your account name and select Downloads from the dropdown menu. 7. Find your purchase listing for ARMember, click the green Download button, and choose License certification & purchase code (text). 8. After the file is downloaded, open the folder and copy your purchase code. 9. Back in your WordPress admin, go to ARMember… General Settings. 11. Click the Activate button and you should see a notice that Your license is currently active. You are now ready to use ARMember. The Manage Members section of ARMember lists your members, along with various information about them, including their username, email address, membership type and plan, status, first and last name, join date, and more. You can also manually add new members. This is where you manage your different membership plans. It lists the plan name, plan type, number of members in the plan, the content restrictions shortcode, and more. You can also add new membership plans in this area of ARMember. This is where you configure your membership registration page. It provides the shortcode for creating the page that takes a new customer through choosing a plan, signing up, and paying for their membership. This is where you create and manage the various forms for your membership site. With ARMember’s built-in drag and drop form builder, you can create beautiful, CAPTCHA-free forms for registration/signup, logging in and out, forgotten passwords, changing passwords, editing your profile, and closing your account. By default, all content on your site is accessible by anyone. The Access Rules section of ARMember is where you choose which content to protect based on the different membership plans you have. ARMember allows you to restrict content access by pages, posts, post types, taxonomies, navigation menus, categories, and more. Payment History lists a variety of information around payment transactions you’ve received from your membership customers. This section includes information about transaction IDs, users, memberships, payment gateways, payment types, customer emails, the status of transactions, payment dates, payment amounts, and credit card numbers. You can also add manual payments here. This is where you create the different notification messages that are sent out to both yourself and your users. It covers email messages for signup notifications, changing passwords, updating profiles, failed payments, and more. You can also create new email notifications. This is where you view and create the basic settings for the overall operation of ARMember. It includes items like product license information, setting up payment gateways, basic email settings, default access rules, frontend font settings, global CSS, assigned pages (for registration, login, forgotten passwords, profile edits, etc. ), security options, import/export options for users and settings, and creation of common messages for your users. The Addons section includes six additional membership modules that you can choose to activate and configure for your site. They include modules for social features, building your email list, dripping content, signing up and logging in through social accounts, coupons, and integration with BuddyPress for community building features. By clicking on the Documentation link, you’ll go to ARMember’s extensive documentation, directly on their website. The people behind ARMember did a very good job providing written help for all the features and functionality of their plugin. Step One: The first thing you want to do when using ARMember is to configure the basic settings for the plugin at ARMember… General Settings. Under General Settings, pay particular attention to entering you product license, email settings, default access rules, payment gateways, page setup, and security options. Step Two: After making your basic settings through the General Settings tab, you’ll want to set up your different membership plans at ARMember… Manage Plans. Adding plans is easy with ARMember, and the program allows you to set up an unlimited number of plans for your site. Here’s where you set up free and paid plans, subscription plans, trial periods, specify payment processors, and more. This is also where you decide which information on your site goes to each plan. 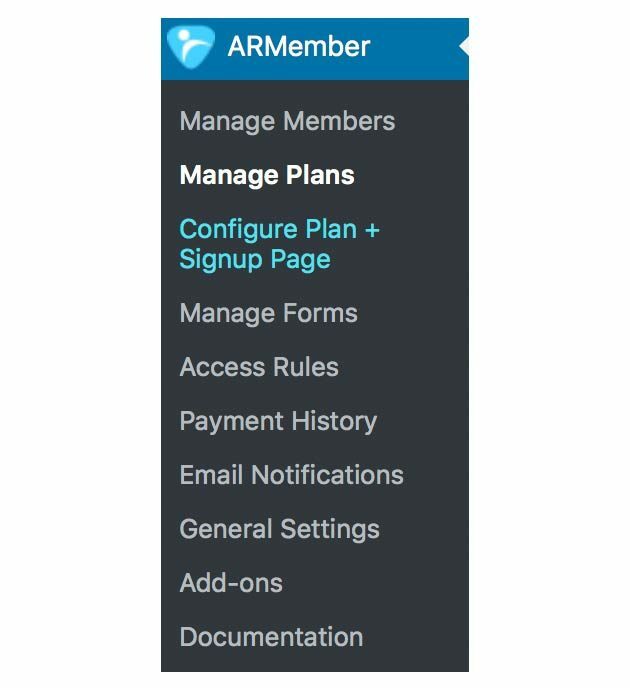 The Manage Plans section of ARMember lists any existing membership plans you’ve created, along with the Free Membership plan that’s created by default. If you choose Paid Plan for the plan type, you’ll need to input additional information such as plan amount (cost), plan duration (lifetime versus limited period), payment type (one-time payment versus subscription), and more. It’s easy to give prospects free access to paid plans by turning on ARMember’s Trial Period. All you have to do is click a button to turn it on, and then specify the amount of time you want to give your users free access to the plan. Step Three: After setting up the different plans you wish to have for your membership, you’ll want to set up payment options at ARMember… General Settings… Payment Gateways. If you choose to offer paid membership plans, ARMember requires at least one payment gateway. ARMember supports 25 currencies and is PCI compliant so that customer data is kept secure. 1. Log into your PayPal Business or Premier account. 2. In the top navigation area of PayPal, click the Profile link and select Profile and Settings. 3. Click the My selling tools link in the left sidebar. 4. For the API access item, click Update. 5. Click the Request API credentials link under NVP/SOAP API integration. 6. Click the Agree and Submit button. 7. Copy and paste the information for API Username, API Password, and API Signature into WordPress. Step Four: The next step for setting up ARMember is to create the various forms you’ll need for your website. This is done at ARMember… Manage Forms. You can either edit or use the default forms as they are through the provided shortcodes, or you can create new forms by clicking on the + Add New Form button. ARMember offers powerful customization with their advanced, built-in form builder. The drag and drop functionality gives users the freedom to create beautiful, CAPTCHA-free modal forms for registration/signup, logging in and out, forgotten passwords, changing passwords, editing your profile, and closing your account. The included form builder, templates, and other customization offerings go far beyond the standard form template choices of other membership plugins. Once you have a form the way you want it, just copy and paste the shortcode into the appropriate WordPress page. Step Five: After creating the various forms, you’ll need to restrict the content of your membership site. There’s a few places to do that with ARMember. The broadest level for protecting your content is done at ARMember… Access Rules. By default, ARMember doesn’t protect any of the content on your site. Through the Access Rules section, you can choose the type of content you want to protect (e.g., pages, posts, categories, taxonomies, menus, etc. ), and you can choose whether or not to protect specific content (that falls within a content type), for different membership plans. This feature is very handy because it allows you to quickly change the protection settings for your content from within one window. The WordPress page/post editor is another area that allows you to restrict content. For example, by selecting a range of text within the page editor, you can click the Restrict Content button, and the selected content (not the entire page content), will be restricted for the membership plans you choose. Also within the WordPress page/post editor, you can choose to turn on Protection for an entire page or post. Then, just choose the membership levels that you wish to have access to the content. ARMember also provides the ability to drip content. Dripping content allows you to publish content based on delayed time intervals of your choosing. This can be done by going to ARMember… Add-ons… Drip Content. Click the green Activate button for the module, and then click the blue Configure button. Once configured, you’ll see the Drip Content link in the sidebar of your WordPress admin. From there, you can click the + Add Rule button to create drip rules for putting out content over a period of time to different membership plans. With ARMember, you can drip content immediately, a specified amount of time after someone subscribes, or from a specific date onwards (date range). Generally speaking, to drip content, it’s a matter of selecting the Content Type you want to drip (e.g., posts, pages, etc.) and the Membership Plan that the drip rule is applied to. Step Six: The last step for your membership site is to create the signup page for new customers. This page will allow new customers to choose between membership plans, sign up as new users, and make a payment. To create this page, go to ARMember… Configure Plan + Signup Page, and then click the + Add New Setup button. This section includes options for the membership plans you wish to show, sign-up forms, payment gateways, coupons, and more. If your site includes any paid membership plans, you must have at least one payment gateway configured. After filling in the appropriate information, you’ll get a single shortcode that you can paste into a WordPress page in order to take users through the process of choosing a plan, signing up for the plan, and making a payment. This section also includes different styling skins, numerous layout options, the ability to choose your fonts and colors, custom CSS, and more. At this time, ARMember comes with six additional membership modules that can be activated and configured separately, apart from the core plugin. This module turns on features such as a member directory, member profile, member badges and achievements, social profile fields for the registration/sign-up form editor, and more. ARMember provides various templates for the creation of member directory and member profile pages. The Opt-ins module integrates with external email marketing services like MailChimp, AWeber, and Constant Contact to help you build your subscription list as users register. The Drip Content module allows you to deliver your content over a specified time interval, rather than allowing access all at once. This module allows users to sign-up or login through their social accounts. Supported social accounts include Facebook, Twitter, LinkedIn, Google +, and VK. The Coupon module allows you to offer coupons to users when making payments for your membership site. This module allows you to use BuddyPress to develop a community within ARMember (including user groups, messaging, activity streams, and more). ARMember lets you easily personalize and customize the email notifications you send to your membership users. This is done at ARMember… Email Notifications. This section of ARMember allows you to send out email notifications to both yourself (as the admin), and to your users. To create new email notification messages, just click on the + Add New Response button. From there, you can decide when to send the email message (e.g., on new subscription, on subscription change, on failed payment, when a trial is finished, when the membership expires, and before a membership expires). After choosing when to send the message, you create your message within a visual HTML editor. ARMember includes numerous template tags to help you personalize and customize your emails. In the WordPress post and page editor, ARMember has a Membership Shortcodes button. It provides membership shortcodes for forms, action buttons, and a large number of other membership features and functions. In the Advanced tab of the membership shortcodes, you also get a description of what each shortcode does. • They have extensive documentation on their site, which you can get to through the ARMember… Documentation link in the WordPress admin sidebar. • The people behind ARMember have created several tutorial videos to help get you up and running with the plugin. • You can also try out a demo of the plugin here. • ARMember also includes a helpdesk for sending them specific questions. • Within ARMember’s interface, you can also roll over help icons to view information about a feature. ARMember is a very good value. It costs $32 for a regular license, which includes all future updates and six months of support. For an extra cost of $10.50, buyers can extend support up to 12 months. ARMember is an impressive WordPress membership plugin that offers both basic and high-end features in a clean, well-designed user interface. I’ve found that many WordPress membership plugins with advanced features and functionality end up getting bogged down in the details, which can lead to a high learning curve for users. ARMember does a great job of offering a deep feature set while remaining an intuitive and easy-to-use product. I’m impressed with how easy it is to use features such as trial periods and coupon offerings with little more than the click of a button. I also like that they offer a number of free “Add-ons” that can be activated and configured individually, allowing you to pick and choose modules that go beyond the plugin’s core offerings. ARMember’s ability to show or hide navigation menu items based on membership levels, as well as being able to add login and signup modal forms to menus, are unique features that are nice to have, as well. From its numerous templates and skins, to its advanced, built-in drag and drop form builder, ARMember also offers strong design features to its users. Furthermore, I like how ARMember gives you the ability to quickly set bulk protection on different content types. For instance, you can easily set protection on all content within a WordPress category through the plugin’s Access Rules section. That said—and this goes for most membership plugins—I think it would be helpful if ARMember provided its users a clearer, step-by-step workflow for the basic setup of a membership site. Instead of users needing to sort out the proper steps for themselves (especially novice users), it would be nice to see the user interface provide a bit more “handholding” in regards to the steps necessary for starting a membership site. Overall, ARMember is an excellent option for WordPress users looking for great value in a membership plugin. Its interface is clean and fairly intuitive, its feature set is deep enough to handle the needs of most users, and its price makes it extremely attractive. If you’re looking for an easy-to-use WordPress membership plugin with a lot to offer it users, you can find out more about ARMember here. Thank you David! I found your review to be very helpful. I think I’ve narrowed down my choice of membership plugin to ARMember and Ultimate Membership Pro (both of which I have seen featured on WP Mayor). Which one would you opt for? That’s a tough one without knowing the specific requirements for your membership site. 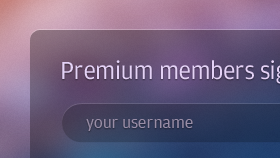 They’re both very impressive plugins, but Ultimate Membership Pro is a bit more mature because it’s been around longer. I really don’t feel you can go wrong with either one though, they’re both good products. My needs are pretty basic in that I won’t be charging for content access. I just need a robust, easy to manage membership system that has social login and flexible placement of login and registration forms. Then I’ll be adding linked info to the user account page so that users can access details of order info that they’ve submitted to a set of CPTs I’ve setup. However, I understand that’s outside the standard functionality of such membership plugins so will probably require me to tinker with the PHP a little. For anyone reading this conversation having been faced with the dilemma that I was of which WP membership to buy, I have an update. I took the plunge and bought ARMember in the Envato Cyber Monday sales for half price. Never have I been so pleased with spending $16! ARMember is a truly outstanding WP membership plugin. The latest version (1.5) improved the feature set so that there’s nothing between it and UMP. The big difference is that ARMember functions much better than the competition and is far, far easier to use. It’s also possible to customise every aspects of the look and feel of the forms with ease. Brilliant, just brilliant! I’v installed ARmember and we got many bugs, like paypal payment history don’t work, recurring member importation don’t work. Support is very slowww. I took the plunge and bought ARMember in the Envato Cyber Monday sales for half price. Never have I been so pleased with spending $16! ARMember is a truly outstanding WP membership plugin. The latest version (1.5) improved the feature set so that there’s nothing between it and UMP. The big difference is that ARMember functions much better than the competition and is far, far easier to use. It’s also possible to customise every aspects of the look and feel of the forms with ease. Brilliant, just brilliant! I took the plunge and bought ARMember in the Envato Cyber Monday sales for half price. Never have I been so pleased with spending $16! ARMember is a truly outstanding WP membership plugin. The latest version (1.5) improved the feature set so that there’s nothing between it and UMP. I been so pleased with spending $16! ARMember is a truly outstanding WP membership plugin. The latest version (1.5) improved the feature set so that there’s nothing between it and UMP. The big difference is that ARMember functions much better than the competition and is far, far easier to use. It’s also possible to customise every aspects of the look and feel of the forms with ease. Brilliant, just brilliant! I’v installed ARMember on one of my site. I’v imported the 250 over members. Importation was not easy and “bugless”. All imported recurring member’s payment are not synced with paypal. The only solution is to ask members to cancel their old imported subscription and reapply. Members subscription dates can’t be edited. Plugin is not FULL multi-language (like email responses and Plans). Manual payment don’t give many options, like paypal, cheque, cash, or other gateway.But is you are not a real programmer beware. Service is VERY SLOW and answers often vague and solution sometime “patchy”. They also dare to tell me that I’v opened too many tickets (I’v paid twice for support). The documentation is so basic that it is useless when you have problem. There is also no Forum or community to rely on. I seem negative about the plugin but it include lots of features that would normally require other plugin. The plugin it great, it’s one time payment (no annual fees) which is great. recently i came across above comment of yours, i believe i must write clarification otherwise people will be misguided. it seems you were not happy with couple of things of armember, and hence you wrote negative comment about ARMember. i think what you wrote here is out frustration. You have couple of misunderstandings. like, regarding payment autodebit sync, in any membership plugin when you first use A plugin and have your members subscribe with paypal monthly auto debit and then migrate to B plugin then that new plugin can not sync the payment status as both plugin are different and differently coded, different variables are used. so, its very obvious and true for any membership plugin available in wordpress market. And regarding manual payment moethods i think you had not check properly as you have many options available paypal, stripe, authorize.net, 2checkout, bank transfer etc all methods are available within the plugin itself. so, please feel free to contact support staff if any further assitance needed. Yes I seem frustrated, I’m not about ARMember. As I said before, I made lots a reviews and testing on my dev site and ARmember was the easiest to manage for my client. It’s also very complete for dealing with restricted content and menu. It merge and sync members perfectly with WP Users. I’m about to install WooCommerce and with my testing it will work without adding plugging. For multi language its not seamless but I can manage (I use polylang). I recommend it for new installation, but for migration think twice. For manual payment it lack basic feature and my client use only Paypal. They should open a forum too, for community helping.